Latest Dance Leotard styles for men, women, and girls for sale online. Balera Adult Cotton Camisole Leotard: This classic adult leotard features a modest camisole neckline and a bra-friendly, high back scoop for more coverage. Soft, 4-way stretch cotton fabric allows for comfort and ease of movement. Adult sizes feature a shelf bra for additional support. Imported.Fabric : Cotton/Spandex. Balera Girls Cotton Camisole Leotard: This classic girls' leotard features a modest camisole neckline and high back scoop for more coverage. Soft, 4-way stretch cotton fabric allows for comfort and ease of movement. Child sizes feature a full front liner. Imported.Fabric : Cotton/Spandex.For adult colors and sizes, see Cotton Camisole Leotard - CL1270. Balera Adult Cotton Pinch Front Leo: This classic adult camisole-style leotard features a pinch-front neckline and modest back scoop. Soft, 4-way stretch cotton fabric allows for comfort and ease of movement. Adult sizes feature a shelf bra and crotch liner. Imported.Fabric : Cotton/Spandex. For kid's sizes, see Balera Girls Cotton Pinch-Front Leo CL1610C. Balera Girls Cotton Pinch Front Leo: This classic girls' camisole-style leotard features a pinch-front neckline and modest back scoop. Soft, 4-way stretch cotton fabric allows for comfort and ease of movement. Child sizes feature a full front liner. Imported.Fabric : Cotton/Spandex. For adult sizes, see Balera Adult Cotton Pinch-Front Leo CL1610. Balera Adult Cotton Tank Leotard: This classic adult tank-style leotard features a modest scoop neckline, wide supportive straps and a bra-friendly, high back scoop. Soft, 4-way stretch cotton fabric allows for comfort and ease of movement. Adult sizes feature a shelf bra and crotch liner. Imported.Fabric : Cotton/Spandex.For child colors and sizes, see Girls' Cotton Tank Leotard - CL1750C. 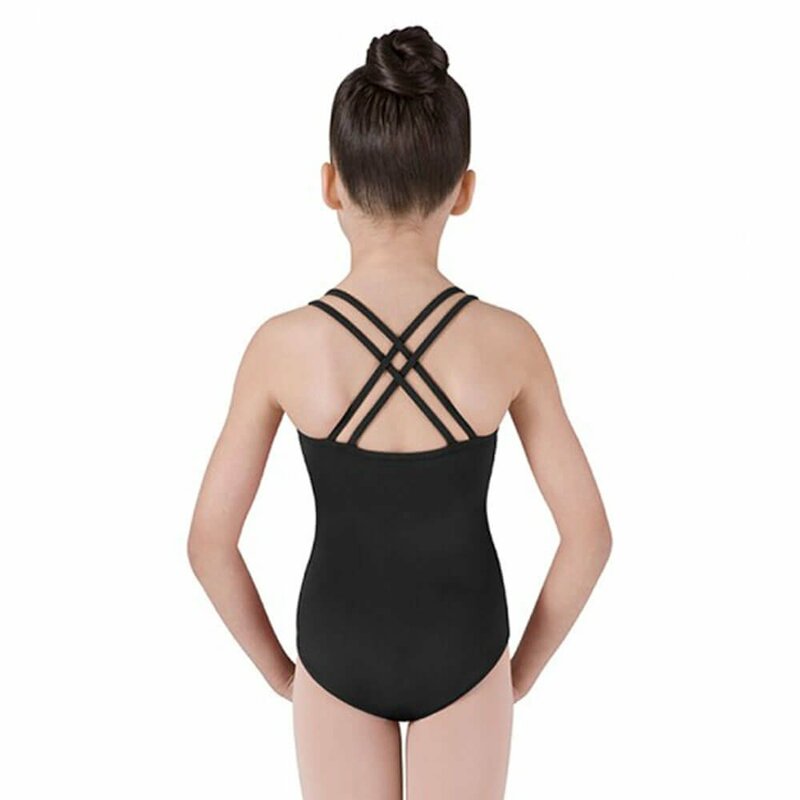 Balera Girls Cotton Tank Leotard: This classic girls' tank-style leotard features a modest scoop neckline, wide supportive straps and a high back scoop. Soft, 4-way stretch cotton fabric allows for comfort and ease of movement when stretching, rehearsing or performing. Child sizes feature a full front lining. Imported.Fabric : Cotton/Spandex.For adult colors and sizes, see Cotton Tank Leotard - CL1750. Balera Metallic and Plush Gym Leotard: This plush-velvet and metallic gymnastics leotard has a silver metallic inset detail, a scoop neckline with wide, supportive racerback straps and a keyhole cutout in back. Fully lined. For competition-ready style, a matching hair scrunchie (included) finishes off the look. Imported.Fabric : Nylon/Spandex. Bloch Microlux Leotard: Bloch's essential short-sleeve leotard features a ballet cut legline and full front lining. Imported.For children's sizes, see Bloch Kids' Microlux Leotard - CL5602. Bloch Microlux Tank Leo: Bloch's essential tank leotard features a ballet cut legline and full front lining. Imported. For children's sizes, see Bloch Kids' Microlux Tank Leo - CL5605. Body Wrappers Mesh Zip Leo: This leotard features a mock neck with a zip-front bodice. A matching power mesh back with gathered center line adds interest. With self-lining in the front bodice. Made in USA.Fabric : Nylon/Spandex. Body Wrappers Mesh Leotard: This beautiful leotard features a v-neckline with power mesh insets under the bust and at the chest. The low-cut v-back is also constructed of power mesh; the bodice is made with shiny nylon and spandex for a comfortable fit. Made in USA.Fabric : Nylon/Spandex. Body Wrappers Mock Neck Leo: This leotard features a mock turtleneck with a secure back closure and a low, open back. The bodice has slimming front princess seams and memoryStretch front lining. Made in USA.Fabric : Nylon/Spandex. Body Wrappers Belted Cami Leo: This leotard features camisole straps, a sweetheart neckline and slimming front princess seams. The belt is separate but attached at the seams for easy wear and care. With memoryStretch front lining. Made in USA.Fabric : Nylon/Spandex. Double Platinum Adult Emballe Lace Boatneck Tank Leotard N7264: Command the stage in this stunning tank leotard. Features include a chic high cut neckline, shelf lining, an open keyhole back with a plastic hook closure at the neckline, and a ballet cut leg line. Mix and match the entire Emballe lace collection for a uniquely elegant dance costume. 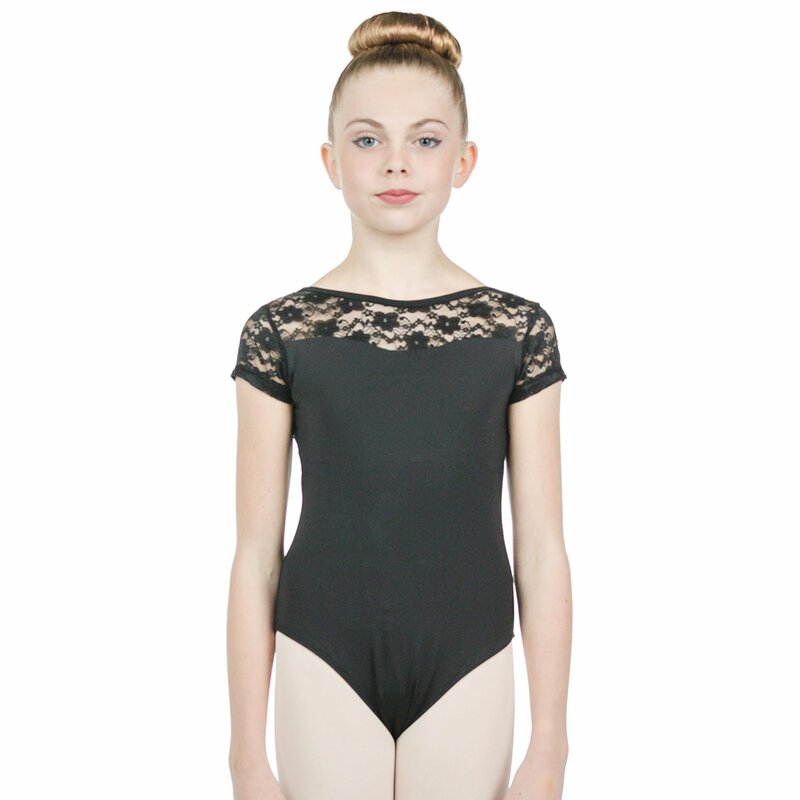 Double Platinum Child Emballe Lace Boatneck Tank Leotard N7264C: Command your stage in this stunning tank leotard. Features include a chic high cut neckline, shelf lining, an open keyhole back with a plastic hook closure at the neckline, and a ballet cut leg line. Complete your dance costume with the other mix-and-match Emballe pieces. Double Platinum Adult Matte Metallic Short Sleeve Leotard N7273: Double Platinum's new Matte Metallic Collection features modern silhouettes that are guaranteed to steal the spotlight! This one-of-a-kind cap sleeve leotard features matte metallic pleather-inch fabric on the bodice and a trendy open Y-back. Leotard has bodice lining and a jazz cut leg line. Ideal for performances! Double Platinum Adult Matte Metallic Mock Neck Tank Leotard N7275: Double Platinum's new Matte Metallic Collection features modern silhouettes that are guaranteed to steal the spotlight! This sporty tank leotard features matte metallic pleather-inch side and bodice inserts and a trendy zip front. Leotard has bodice lining and a jazz cut leg line. Double Platinum Adult Matte Metallic Mock Neck Long Sleeve Leotard N7279: Double Platinum's new Matte Metallic Collection features modern silhouettes that are guaranteed to steal the spotlight! This long sleeve leotard features a mock neck collar, matte metallic pleather-inch side and bodice inserts, and a trendy zip front. Leotard has front bodice lining and a jazz cut leg line. Double Platinum Adult Sequin Camisole Leotard N7309: This sequin camisole leotard is ready for its close up, and so are you! This sassy leotard features all over sequin fabric, matching metallic camisole straps and trim, a scoop neckline, front and back lining, and a jazz cut leg line. Use for a number of different looks as your new, must-have performance leotard! Double Platinum Girls Sequin Camisole Leotard N7309C: This sequin camisole leotard is ready for its close up, and so are you! This sassy leotard features all over sequin fabric, matching metallic camisole straps and trim, a scoop neckline, front and back lining, and a jazz cut leg line. Use for a number of different looks as your new, must-have performance leotard! Natalie Adult Striped Mesh Cap Sleeve Leotard N9005: Your beauty will be transparent in this modern mesh insert short sleeve leotard. Leotard features mesh vertical front, yoke, and plunging u-back mesh inserts, inner shelf bra with plush elastic, and ballet cut leg line. Natalie Adult Plus Striped Mesh Cap Sleeve Leotard N9005P: Your beauty will be transparent in this modern mesh insert short sleeve leotard. Leotard features mesh vertical front, yoke, and plunging u-back mesh inserts, inner shelf bra with plush elastic, and ballet cut leg line. Natalie Womens Mesh Long Sleeve Leotard N9006: A classic silhouette with a contemporary twist - this long sleeve leotard features mesh yoke long sleeves, front and back mesh yoke insert, a solid colored bodice, a front bust lining, and a jazz cut legline. Natalie Girls Mesh Long Sleeve Leotard N9006C: A classic silhouette with a contemporary twist - this long sleeve leotard features mesh yoke long sleeves, front and back mesh yoke insert, a solid colored bodice, and a jazz cut legline. Natalie Womens Plus Size Mesh Long Sleeve Leotard N9006P: A classic silhouette with a contemporary twist - this long sleeve leotard features mesh yoke long sleeves, front and back mesh yoke insert, a solid colored bodice, and a jazz cut legline. Reverence Womens I Care Bustled Performance Tank Leotard RV1822P: Fill the stage with elegance in this dreamy leotard featuring tank sleeves, a front sheer mesh insert, a sweetheart lace overlay bodice, a sheer mesh insert under the bust, side cutouts, sheer mesh back straps, a back keyhole, an exposed lower back, and an attached bustle. Rhinestones and applique not included. Reverence Womens Mock Neck Performance Cap Sleeve Leotard RV2430: Look fierce in this stunning cap sleeve leotard featuring an allover marble-style colorway, mock neck, side cutouts, a neck closure, keyhole back, and an exposed lower back. Applique is not included and gloves are sold separately. Reverence Womens Metallic Bustled Performance Tank Leotard RV6026: Glisten and glow in this stunning tank leotard featuring a flattering front metallic insert, a low scoop back, a metallic back insert, an attached bustled open front lace skirt, and attached briefs. Reverence Womens Metallic Performance Tank Leotard RV6027P: This timeless leotard features tank sleeves, an allover metallic print, contrasting front lace panels, a low back, and a contrasting back lace panel. Leotard does not come rhinestoned. Theatricals Adult Camisole Cotton Dance Leotard N5500: Camisole leotard has adjustable straps, a shelf lining, and a ballet cut leg line. White is front lined. Theatricals Kids Camisole Cotton Dance Leotard N5500C: Camisole leotard has adjustable straps and a ballet cut leg line. Child sizes are fully lined. 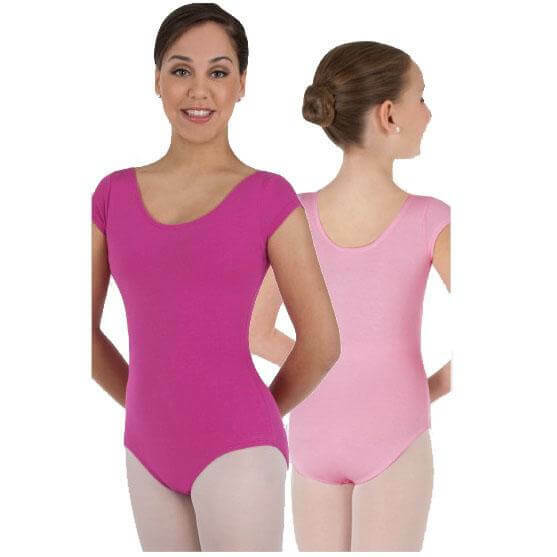 Theatricals Adult Pinch Front Tank Cotton Dance Leotard N5501: Tank leotard features princess seaming, a pinched front sweetheart neckline, front lining, and a ballet cut leg line. 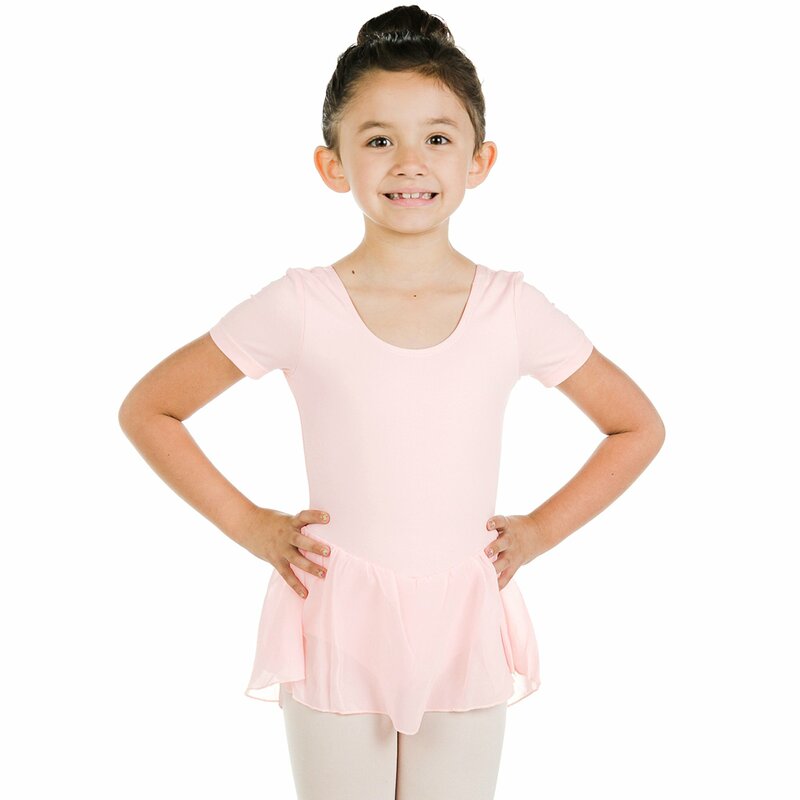 Theatricals Girls Tank Dance Leotard N5501C: Tank leotard features princess seams, a pinched front sweetheart neckline, front lining, and a ballet cut leg line. Theatricals Girls Short Sleeve Dance Leotard N5502C: Short sleeve leotard has a ballet cut leg line and full front lining in child sizes. Ashley Bouder Adult Lace Sweetheart Cap Sleeve Leotard NAB117: From the Ashley Bouder collection, this beautiful floral lace short sleeve leotard features a flattering sweetheart neckline, shelf lining, and moderate cut leg line. Perfect for rehearsal and performance! BalTogs Adult Mock Turtleneck Leotard 368: BalTogs sleeveless mock turtleneck leotard has princess seams and a matching zipper front. Great performance piece. BalTogs Adult Nylon Tank Thong Leotard 843: 80's inspired tank leotard features a thong back, cotton gusset, and jazz cut leg line. Leotard is unlined. Ideal for wearing under or over tights and leggings. This garment must be individually hand washed in cold water. Colors may bleed if washed in a washing machine. BalTogs Child and Toddler Floral Lace Cap Sleeve Leotard BT5070C: Your little dancer is sure to love this darling short sleeve leotard! Features include a floral lace neckline and sleeves, front bodice lining, a sweet bow-back detail, and a ballet cut leg line. Add the matching lace skirt for an adorable recital look! 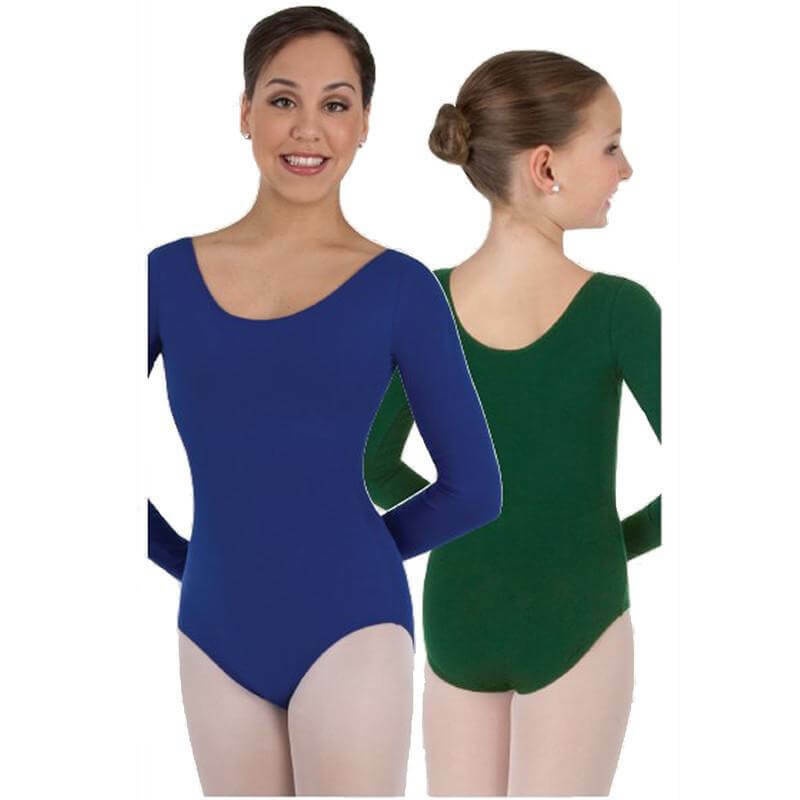 BalTogs Adult Short Sleeve Velvet Leotard BT5081: This flattering cap sleeve leotard features a mesh neckline, shelf lining, mesh back, velvet sweetheart trim, and princess seams. Features a ballet cut leg line. BalTogs Adult 3/4 Sleeve Velvet Leotard BT5082: This classic design features 3/4 sleeves, velvet bodice, mesh sleeves and back, and princess seaming. Leotard has a ballet cut leg line. BalTogs Adult Two-Tone Halter Leotard BT5091: This super sporty halter leotard features bodice lining and a jazz cut leg line. A great addition to your class and performance wear collection! BalTogs Adult Pinch Front Camisole Leotard BT5170: This basic camisole leotard features flattering front princess seaming, a pinch front neckline, and a simple scoop back. Leotard has a jazz cut leg line and shelf bra lining. Great for practice or class! 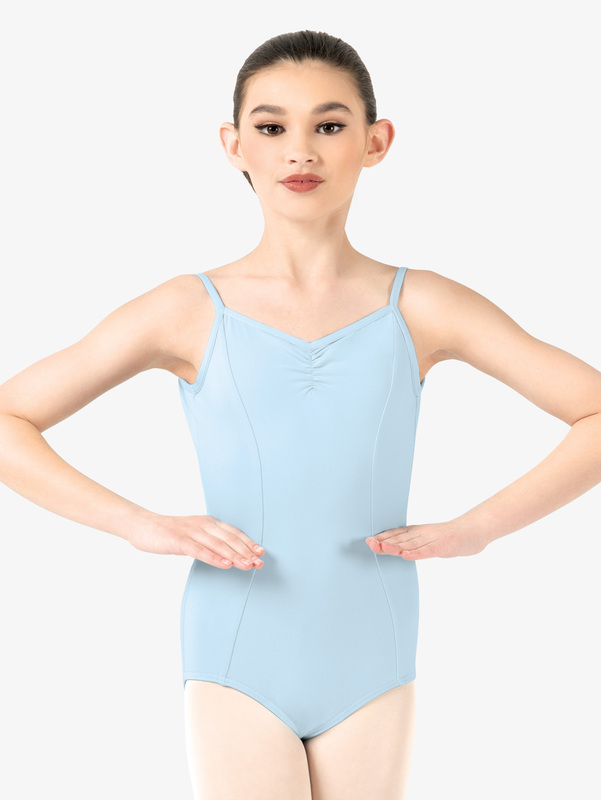 BalTogs Girls Pinch Front Camisole Leotard BT5170C: This basic camisole leotard features flattering front princess seaming, a pinch front neckline, and a simple scoop back. Leotard has a jazz cut leg line and full front lining. Great for practice or class! BalTogs Adult Pinch Front Short Sleeve Leotard BT5171: This basic cap sleeve leotard features flattering front princess seaming, a pinch front neckline, and a beautiful pinch back. Leotard has a ballet cut leg line and shelf bra lining. Great for practice or class! Bloch Womens Floral Mesh V-Front Tank Leotard L9575: Gleam with elegance in this gorgeous leotard - featuring tank straps with sheer mesh inserts, a v-front, and a mesh back with floral jacquard detail. Many more leotards on sale at Discount Dance Supply and Dancewear Solutions.